Like a traveling troubador with a trunk full of musical stories, Jeff Wilkinson has been called the "John Steinbeck of song." Born and raised in the Detroit area, Wilkinson released his first album, "Pitchin' Pennies" in 1988 (reissued on CD by Gadfly Records in 1994). That first release established his trademark style of poetic songwriting. After relocations to Providence and then New York, Wilkinson released a second, more rock-oriented album ("Brave and True") in 1993. 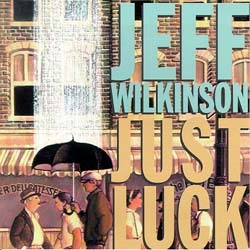 "Just Luck" -- recorded with a full band -- is a partial return to a more subdued sound, once again letting his lyrics and vocals take the front seat. Jeff gets some all-star help on the album, from a song co-written with hit Nashville songwriter Fred Koller, to the use of an Oscar Wilde poem, to backing vocals from Lisa Lowell, who has performed on several Bruce Springsteen albums.